Karina's Kreations: Wood You be Mine Swap Card! Wood You be Mine Swap Card! I'm off to Orlando today for the Stampin'Up Leadership conference and a signed up for a few swaps. This is my masculine swap card using the Wood You Be Mine stamp set. 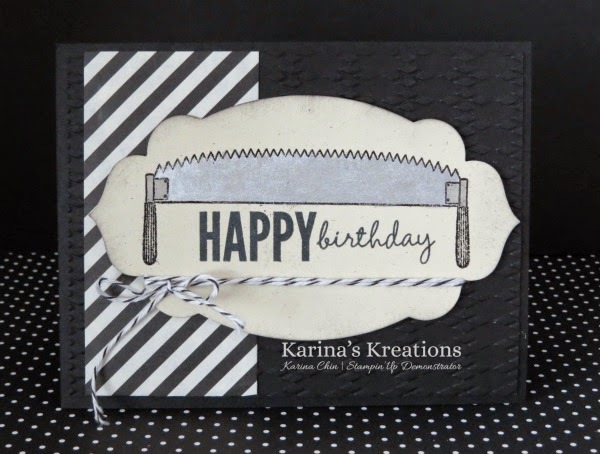 I embossed the saw with black embossing powder and set it with the heat tool. The saw was colored in with Silver Metallic ink refill.